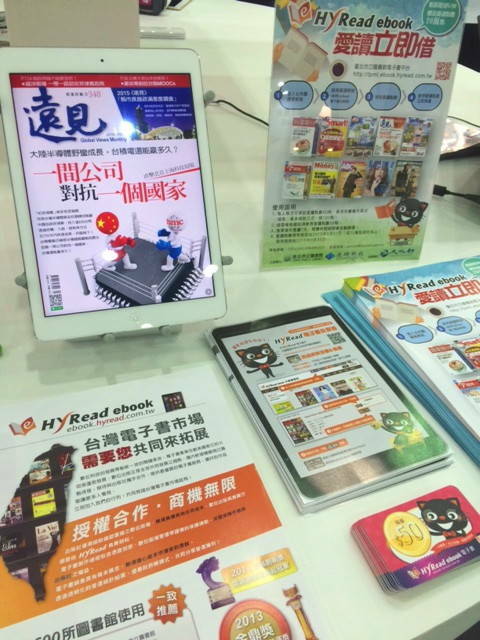 HyRead demonstrated library eBook solution at 2015 COMPUTEX Taipei. TAIPEI, TAIWAN--(Marketwired - Jun 16, 2015) - HyRead is an innovative eBook platform for libraries to provide services. Launched in 2010 by Hyweb Technology Co., Ltd. HyRead collaborate with libraries to offer free loan services for readers. Readers can login with their library accounts to borrow eBooks/eMagazines via the internet. HyRead had the chance to be invited by the Industrial Development Bureau, Ministry of Economic Affairs of Taiwan to take part in the Taiwan Cloud Expo pavilion at the 2015 Computex Taipei. The exhibition took place from June 2 to 6 and gathered Taiwan start-ups providing services linked to the Cloud. The pavilion brings together the cloud industry chain from upstream to downstream, and over 37 companies exhibited. The exhibition was a great chance for HyRead to meet potential partners from all over the world. During the 5 days of the exhibition, HyRead introduced the complete eBook solution to publishers, agents, librarians and also received positive responses from exhibitors. HyRead was founded in 2010 by Hyweb Technology, providing quality content of eBooks and eMagazines. The HyRead eBook solution has been deployed in well over 600 libraries in the world, and the adoption of HyRead solution in academic libraries has archived 100%. HyRead eBook is currently Taiwan's largest traditional Chinese eBook platform, and actively expands overseas business, including Hong Kong, Macau, Singapore, Malaysia, Europe and other regions. HyRead eBook supports different devices to use, including PC, iPad/iPhone, Android smart phones and tablets which provide online reading and download reading. Online reading means that readers can open ebooks directly via browser without installing any software. On the other hand, readers can install the software and download to read eBooks, so that readers can read anytime without internet. HyRead provides diverse ways to meet the needs of readers, no space constraint, and let readers always feel free to read. HyRead eBook receives awards every year. Including "The Best Digital content" (Taiwan I.T. Month Award for Outstanding I.T. Application/Products, 2011), "The Best Android-Tablet APP" (Taiwan Digital Times magazine-App Next Innovative Application Competition, 2012), "The Best Innovative Business Model"(Taiwan Ministry of Culture-The 37th Golden Tripod Awards, 2013) and "Cloud Innovation Application Award Winner" (Taiwan Ministry of Economy-Cloud Innovation Application Award, 2014). The APP "HyRead Libraryit" is so popular that always stays top 10 rank at iOS App Store "Book category" in Taiwan. About Hyweb Technology Co., Ltd.
HyWeb Technology Co.,Ltd. is founded in July 1998 and the initial public offering takes place in March 2003. Hyweb provides solutions for government portal, knowledge management, digital archive, banking system, and so forth. In recent years, Hyweb have been dedicated to developing ebook solutions. Photo caption: HyRead demonstrated library eBook solution at 2015 COMPUTEX Taipei.